Dr. Hauschka oil-free night care allows skin to breathe freely while supporting its natural renewal processes. Night Serum is essential nighttime skin care that revitalizes and helps the skin rediscover its natural balance. The result is a fresh, radiant complexion by morning. Formulation: The wonderfully fragrant formulation with apple fruit hydrosol and apple blossom extract supports the skin’s natural rhythms and essential nighttime work. Witch hazel extract tones. Using the "no oil products at bed time" routine with this night serum has balanced out the oily spots and dry spots on my face. It was difficult to wrap my head around not lathering a bunch of junk on my skin before bed like I'd always done, but after a week of using this lovely, light night serum, I'm a believer. My husband has even noticed and is so happy that I've found a product with which I'm satisfied! Again, this night serum smells so good and still need more moisture or some more different cream base to put on before apply this on top? I have sensitive skin and this serum was light, protective, and very nourishing. I even wear it during the day under the rose moisturizer. Trying sample sold me. My skin glows after using! Love this product. Favorite Dr Hauschka product to date. In following the Hauschka beliefs I try to use less product on my face at night. I purchased the night serum recently and love the feel it gives my skin. I love using the Night Serum after cleansing and toning before bed. It nourishes and restores the skin on my trouble area, my neck. My neck looks better today than it did 5 years ago. I’ve only been using for a few months. I’ve been using Dr Hauschka for some years now. I recently incorporated it into my routine. I will continue to have it in my routine. Such that, my skin is glowing and refreshed in the morning." Unfortunately I don't use it all the time, but when I do skin feels rejuvenated and way less puffy in the morning. My skin feels deeply nourished and strengthened, yet not greasy or sticky or tacky from too much moisture. Nothing has been better for my morning glow than this night serum. Thank you! The texture is good. Feels good on skin. No significant scent which I do like a lot. I don't notice any difference but just started a month ago. I love this serum. It makes my mature skin look less lined and very smooth. Please don’t ever discontinue this product, it’s my favorite Dr. Hauschka product! I will never buy another brand this stuff is amazing! My skin feels refreshed and calmed every morning after using the night serum. Great for sensitive acne-prone skin. I recommend this product, not just for night use but I also like it during the day when I feel like my skin needs an extra boost. Been a loyal Hauschka client since 2008 and I see a Hauschka esthetician several times a year. it's seems ok - the feeling on skin is not creamy. I have used it on top of an essential oil for the face now in the winter. New go to night serum for me. My skin feels more toned, hydrated, and refreshed after using this serum. As all of Dr. Hauschka products I have selected, I feel this product benefits my issues with fine lines and wrinkles. Very calming fragrance. I received this product a few days ago and I like the the way my face feels and looks in the morning. I wish there was a night serum for mature skins too! My skin feels tightened yet moisturized after using night serum. Leaves a great glow and brightness to my skin. Will continue to use. Love the new Night Serum product! Makes my skin feel so soft. The Night Serum is thicker than the day serum, but I'm not sure it absorbs as fully as the day. My skin is very dry and I live in an area with high humidity so I sweat a lot when working outside. I think I need more time using to reap the full benefits. Apply a thin layer (which makes the tube last long) at night over Dr. Hauschka Toner for a remarkable night of repair. It applies very smooth. I may give 5 stars after I’ve used this product for four weeks. I used to only use toner at night. Very happy Dr. Hauschka introduced the night serum. During winter, when heater is on, the face feels dry in the morning. After using this, the face feels hydrated and smooth. Highly recommend it. I use it every night after cleansing and applying toner. It works well on my sensitive skin. Another staple in my Hauschka skin care regimen! Being 52 I have been battling "a while" against the usual perils of aging particularly when it comes to my skin: - dry, loosing elasticity, more lines, new wrinkles, red patches, dull etc... Having always suffered from extremely sensitive skin - where I generally get some sort of reaction to specialist products - I was hesitant to try the Night Serum BUT I am so glad I did. My skin seems to absolutely love it. It glides on, smells and feels great and I wake up every morning with I dare say 'happy skin' that looks like it has had a restful, regenerating nights sleep. I am purchasing my second tube of this miracle cream and will keep you posted! So far SO GOOD! I tried the sample size but it is so tiny and a bit watery it didn't last long enough to see full results I think. I like the feeling of it on my face. Not very oily or very dry. This went on so easily and worked right away to add much-needed moisture to my face. Love using this serum after cleansing every other night. It tightens up my face and leaves it feeling silky soft in the morning after washing it off. I got a sample size of this and was really amazed at the rejuvenating results on my skin! I have it on my list for next Dr. Hauschka product to purchase! There are very few products that don’t burn and irritate my very sensitive skin, and this is one of them! I received a sample and it was soothing going on at night. In the morning my skin felt less dry and also less oily (very balancing). I am just giving it a four because I didn’t use it long enough; however, I suspect that if I purchase a full-size bottle, I could easily give it a 5! I went cold turkey and didn't use any cream at bedtime after years of using heavy creams for night care. This is a wonderful and sensible way to soothe your skin at bedtime. My skin feels very smooth when I wake up in the morning after using this. I have used it for about a week with the Clarifying kit. I will be buying the large size and will continue using with the clarifying wash cream, clarifying toner, and melissa day cream. Won't go a night without it. Balances/normalizes my skin, makes it feel and look great in the morning. I love this serum . My skin feels firmer. A great way to add moisture to your skin without it being too heavy or greasy. Highly recommend! A wonderful feeling to soothe skin before bed! I got this as a trial size in one of my kits and I love the way it makes my skin feel the next morning! I plan to order the regular size soon. I'm so happy with this product! In the spring and summer I put it on right after I wash my face with the cleansing milk (in the winter I get really dry and use argan oil instead). It feels a little odd right after I put it on, but in the morning my face feels so soft! I'm hooked! Allows my face to breathe at night! I was once a believer in using moisturizers at night, this serum definitely changed my mind. The application of this is smooth and easy to apply. Immediately, I felt my skin tightening. I did not have any residue or sticky feeling after waking up in the morning. I love this product! After years of heavy night moisturizers, I used the Rhythmic Night Conditioner for sensitive skin and after that I switched to use the Night Serum. I find my skin looks healthy and feels good when I wake up in the morning, huge difference from having dry skin even when using heavy moisturizers. Very happy with this serum. I like the idea that less is more and respecting the philosophy our skin is able to rebalance without heavy night care. The night serum absorbs quickly and while my skin feels a little tight initially, this feeling soon disappears and my skin is left feeling soft with a subtle glow. I have also noticed that any skin redness and small pimples calms down or disappears overnight with the serum. Great product and good value. My last tube lasted close to eight months. This is the cream for you, if you don't like oily and greasy on your face before bed but it protects and maintains moisture. I have used a lot of serums out there, including one of the most expensive. Dr. Hauschka's night serum is the best I've found, and leaves my skin looking fabulous the next morning - dewy and healthy. After cleansing and toning in the evenings, apply a pea-sized drop of Night Serum in a thin layer to the face, neck and, if desired, décolleté. 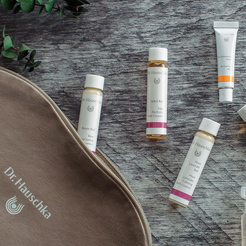 In the morning, we recommend using Dr. Hauschka Day Care products, which protect and help the skin to retain the strength it built up during the night. Night Serum has a unique cap that allows the product to stay fresh without the use of artificial preservatives. 1. Do not unscrew cap when opening product for the first time. Twist cap clockwise to tighten as if closing. Only tighten until the cap stops. This will break the cap's seal. 2. Twist cap off in a counter-clockwise motion. 3. Squeeze out a pea-sized amount of Night Serum. For best use, store Night Serum in a horizontal position. Note: Always hold the tube gently so you will only squeeze out the proper amount of Night Serum needed. Holding the tube too firmly or squeezing the tube too hard will result in the release of more product than is needed and may cause the tube to leak product. If you are new to oil-free night care and your skin is used to an oil-based cream at night, if needed at night, cleanse then apply a pea-sized amount of a Dr. Hauschka mask for 20 minutes. Gently wipe clean with a damp wash cloth, then tone and apply Night Serum. Within a week, your skin will adjust to oil-free night care and the mask will no longer be needed. For advanced care seasonally and as needed, add Renewing Night Conditioner or Sensitive Care Conditioner to your night care regimen. This will replace your toner and Night Serum.